Home » » North Korea and the Brazil passports: Why were they used by the Kims? North Korea and the Brazil passports: Why were they used by the Kims? 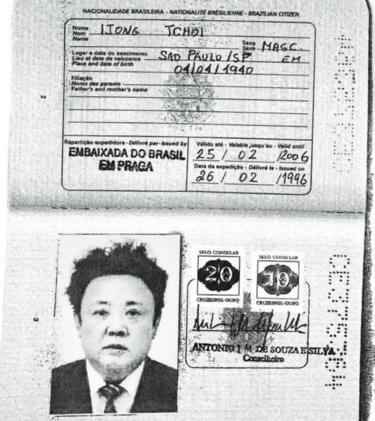 Fresh evidence emerged this week that the North Korean leader Kim Jong-un, and his father and predecessor Kim Jong-il, obtained fraudulent Brazilian passports in the 1990s. Reuters obtained photocopies of the documents, in which a young Kim Jong-un is presented as "Josef Pwag" (son of Ricardo and Marcela) and his father as "Ijong Tchoi". A Brazilian security source told the news agency that the documents - which were issued by the Brazilian embassy in the Czech capital, Prague in 1996 - appeared to be genuine. Other security sources said the documents had been used to apply for visas to visit Western countries, but could not confirm whether the visas had been issued or used. These copies may not constitute conclusive proof, but it's not the first time Brazilian passports have been linked to the Kim family. In 2011, Japanese media quoted officials as saying Kim Jong-un and his brother Jong-chul had entered the country to visit Tokyo Disneyland on Brazilian documents as far back as 1991. Jong-un's older half-brother, Kim Jong-nam, is said to have fallen out of favour with their father in 2001 after he was caught trying to sneak into Japan using a false Dominican passport - apparently also on his way to Disneyland. Obtaining passports fraudulently doesn't seem to have been much of a problem for the Kims.